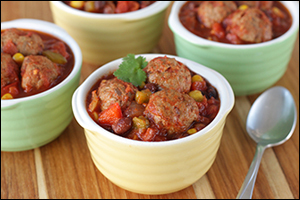 Score big on game day (or any day) with these low-calorie slow-cooker recipes... Touchdown, HG! The saucy deliciousness of chili meets the hearty goodness of meatballs... What a team these two make! In a large bowl, combine all meatball ingredients. Thoroughly mix. Firmly and evenly form into 24 meatballs, and place them on the baking sheet, evenly spaced. Combine all chili ingredients in a slow cooker. Mix well. Transfer meatballs to the slow cooker, and gently stir to coat. Cover and cook on low for 4 hours, or until veggies are tender. 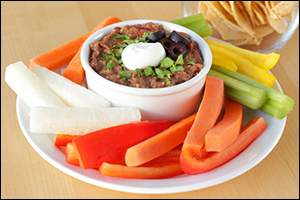 Loads of veggies, beans, beef, and cheese... all for your dipping pleasure! Place beef, beans, and drained tomatoes in a slow cooker. Add seasonings, and mix until uniform. Stir in mushrooms, onion, and jalapeño pepper. Cover and cook on low for 4 hours, or until beef is fully cooked and veggies are tender. Add shredded cheese and cheese wedges, breaking wedges into pieces. Stir until evenly distributed. HG Tip! Use a spoon to seed your jalapeños. When handling jalapeños, don't touch your eyes -- that pepper juice can sting. And wash your hands well immediately afterward. Go long! Pass this recipe to all your pals -- click "Send to a Friend" now. Hey, hey… It's National Nachos Day, November 6th! These Chili Cheese Dog Nachos are too good to pass by.